Flat front trousers have traditionally been made without turn-ups in accordance to the military/equestrian inspired fashion in the second half of the 19th century. A high rise, narrow lower legs and plain finished hems gave a slimming and elongating effect, indeed relevant also in our days. Cuffed flat front trousers have been around since 1890, but not very common and predominantly for city use. For country trousers, plain finished hems were standard, mostly due to functional aspects: Turn-ups get filled up with Mother Nature’s small debris when enjoying the countryside. CorduroyCorduroy is a textile composed of twisted fibers that, when woven, lie parallel (similar to twill) to one another to form the cloth's distinct pattern, a "cord." Modern corduroy is most commonly composed of tufted cords, sometimes exhibiting a channel (bare to the base fabric) between the tufts. 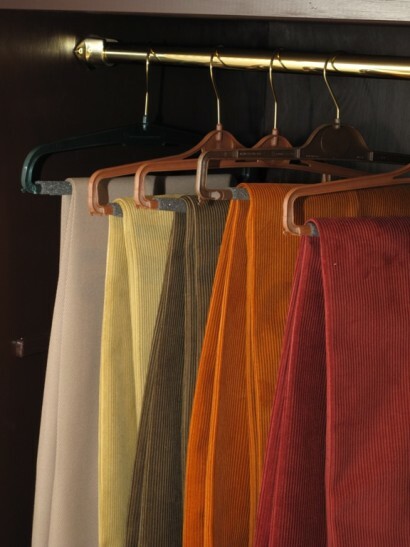 Corduroy is, in essence, a ridged form of velvet. In Sweden known as "Manchester", twillA fabric woven in parallel diagonal ribs, by passing the weft thread alternatively over and under one or more warp threads. Tweed, gabardine, cheviot and denim, for example, are all twills. and moleskin trousers are traditionally more of a country garment, so a plain finish would be the natural choice. However not all gentlemen use their cords mainly for field purposes these days. When taking a walk in the city park, visiting the race track or just enjoying a pint of bitter (or lager, I might add reluctantly) at the local pub, turn-ups will not be in your way. Bad idea. They don't look good on any pants, flat front or pleated. They are also completely unnecessary, unless you need that very special place to collect lint and debris.